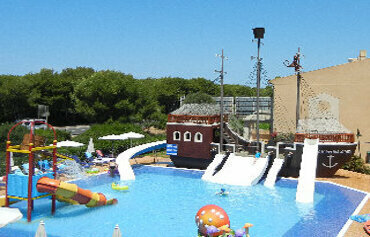 It is fun all the way, when you stay at Hotel Viva Menorca at the heart of Cala n Bosch. This 4 star all inclusive hotel mixes a laid back vibe for adults, with top notch child friendly activities. The swimming pool scene is the star attraction. The large freeform pool and its sun terraces are perfect for lazy days topping up your tan. The children are in for a splashing time with their own fun pool, complete with pirate ship and slides. On dry land, Mum and Dad can chill out in the indoor pool, sauna and Jacuzzi, while tots to teens enjoy fun filled times in the mini and teen clubs. The onsite eateries take care of mealtimes. The main restaurant is a buffet style affair, with themed nights and specials on the menu. Everything from sandwiches and snacks to tapas, pasta and pizzas, are served up during the daytime in the poolside snack bar. The fun continues after dark, when the hotel really comes to life. There is live music and shows for the grownups and a mini disco and games for the little ones. Discover why the Hotel Viva Menorca is a popular place to stay for family holidays to Menorca. 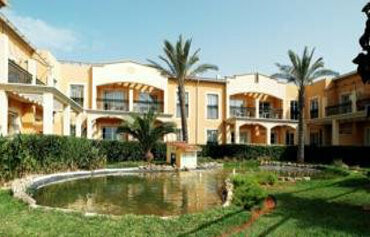 The Hotel Viva Menorca has all the facilities you would expect from 4 star Menorca holidays. Highlights include: A large outdoor swimming pool with sun terraces, sunbeds and parasols, pirate ship pool with slides, buffet restaurant, two bars, free WiFi in the lobby, playground, all day programme for children with activities, themed days, fun and games and a Teeny Club for ages 12 to 15. 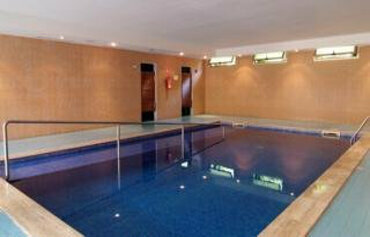 The wellness centre has a freshwater indoor pool, Jacuzzi and sauna. Table tennis, archery, aqua aerobics, football, recreational games and a full sports activity programme are available too. The 24 hour reception offers information about the hotel and area, currency exchange, bicycle rental and medical service. The complex has 164 modern and stylish guest apartments. All apartments have a bathroom with shower, air conditioning, safe for rent, heating, television, music, telephone, hairdryer, free WiFi and a kitchenette with kettle, fridge, microwave and hob with two burners. Breakfast, lunch and dinner buffets, themed buffets and culinary specialities are available in the Caprice Buffet Restaurant. Drinks, snacks, tapas, pizzas, pasta and hot food options are served poolside in the Pool Bar La Palapa. The Babalu Cafe Bar serves a variety of hot and cold drinks, cocktails and ice creams during the daytime and evening. The evening entertainment programme for adults and children includes shows, games and live music. 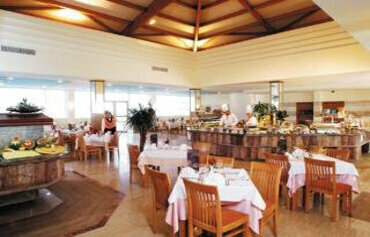 The Hotel Viva Menorca is situated a kilometre from the beach in Cala n Bosch. Ciutadella Harbour is 10kms away and Mahon Airport is approximately 54kms distance. Excellent family hotel with good facilities, good food and good location. The kids entertainment is really good during the day and evening. I have stayed at the hotel twice - once on self catering and once on all inclusive. There are some good quality restaurants in the harbour. Accommodation needs an update as Loooking tired . Amazing hotel, staff work so hard, perfectly located, food top class and all children's needs catered for! Absolutely loved our holiday.. Hotel was fabulous, very clean, lots of food choice, staff were really friendly and helpful. Couldn't have faulted it. Would definitely stay again! Great complex with loads to keep the kids entertained. Apartment was clean and well equipped. Reception staff were friendly and helpful. Complimentary beach towels provided for use during your stay. 20 minute walk to nearest beach so we opted for bus for €3 which came every 15 mins. Beautiful marina with bars and restaurants just 10 minutes away. Going to be booking again.